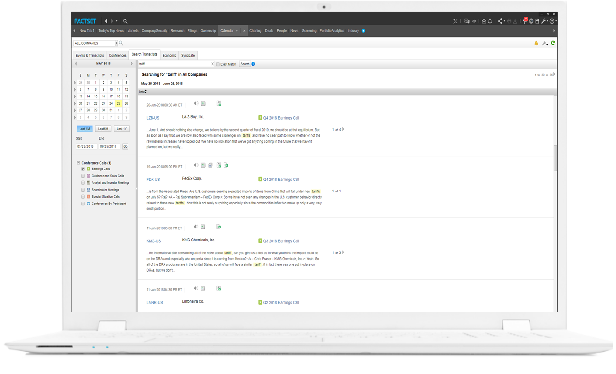 Find and analyze the latest corporate actions. Data and content on the latest important company events and actions. Stay up-to-date on corporate actions, uncover indicators of a company's future financial performance, and find potential merger and acquisition targets and buyers with FactSet event-driven data. Monitor and analyze mergers and acquisitions and corporate activism, find key information in conference call transcripts, determine the potential consequences of announced mergers and acquisitions, and see which companies are looking to quickly raise capital through private placements in FactSet's mergers and acquisitions database. Monitor and analyze corporate activism events and trends. 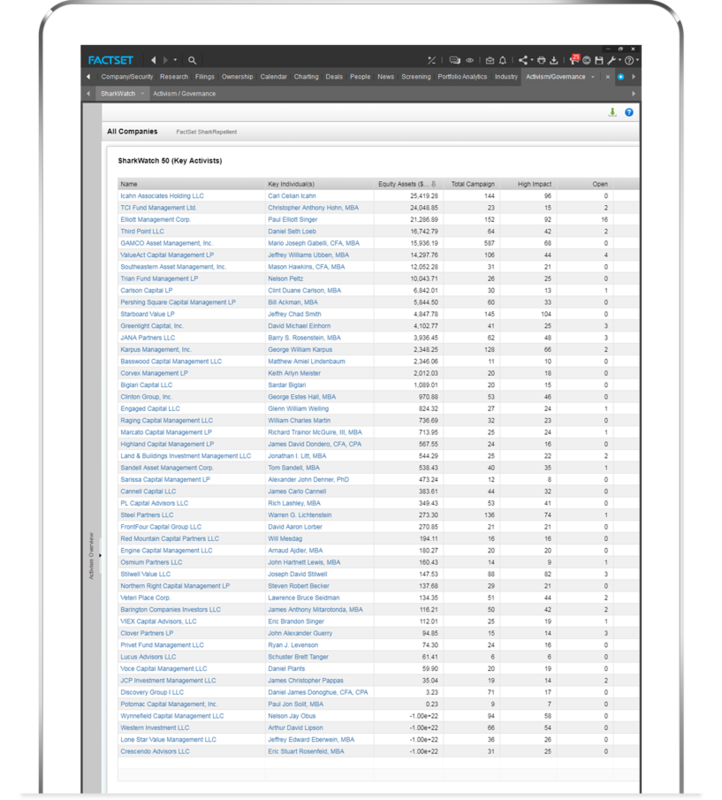 FactSet’s corporate activism database, SharkRepellent, allows you to monitor and analyze corporate activism with data items related to poison pills, significant activism reported in SEC filings and news sources, and key takeover defenses compiled from articles of incorporation, bylaws, and other publicly available sources. Data is available for all U.S. in force poison pills, Canadian in force and ratification pending poison pills, and any other non-U.S. EDGAR filers that adopt a U.S. style poison pill. 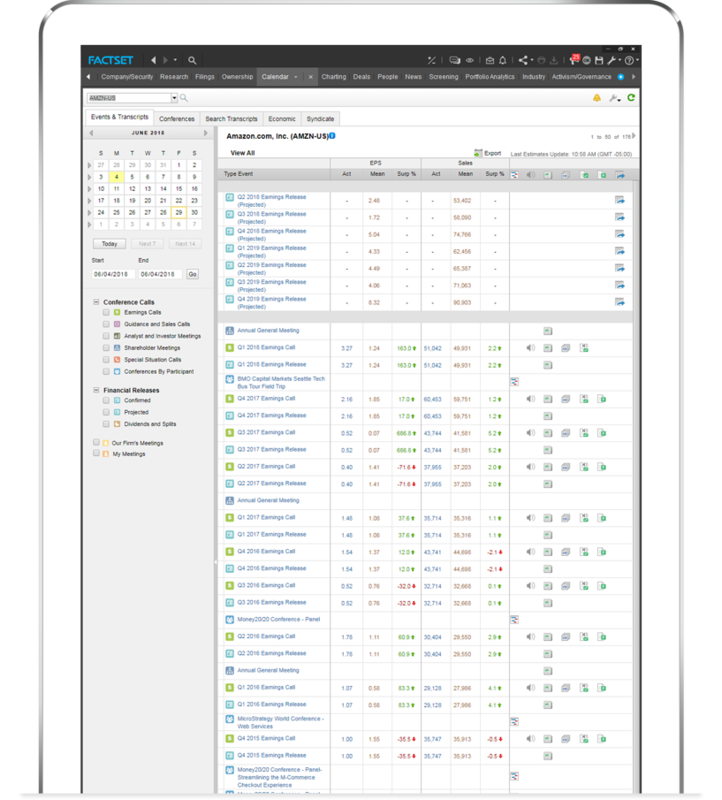 Find and prioritize earnings events and analyze transcripts of earnings calls and meetings. Access a wealth of information for over 1.7 million company corporate events, such as conference call date and time, access details, and participant name and contact information. 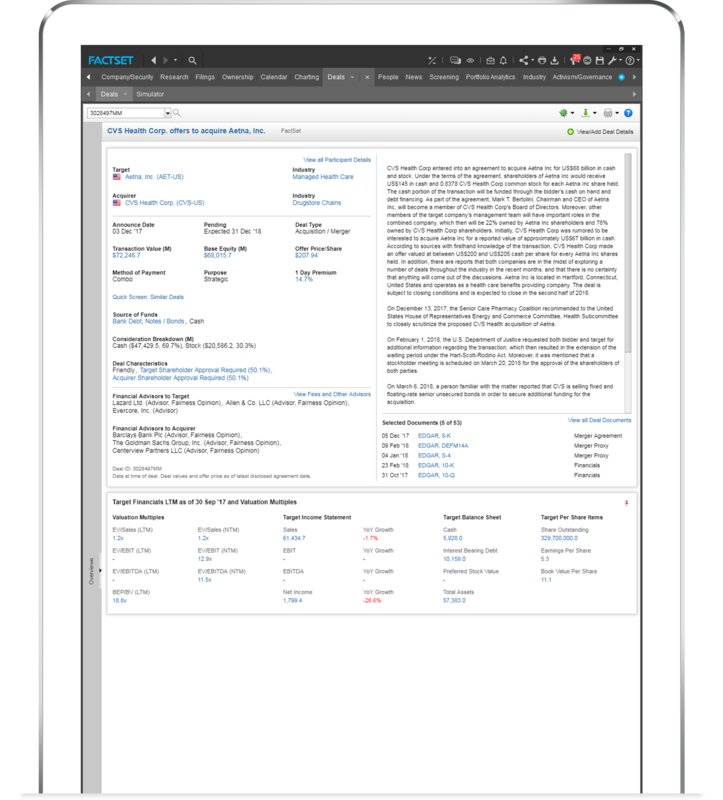 Transcript participants are mapped to FactSet symbology, so you can perform historical analysis on firms, individuals, analysts, or brokers using FactSet’s permanent identifiers. Updated intraday, this datafeed delivers event transcripts in a standardized and tagged XML format for earnings calls and releases, analyst, investor and shareholder meetings, and special events like M&A activity. Get in-depth information on upcoming M&A deal activity. Access detailed information on announced mergers, acquisitions, and divestitures involving both public and private companies. 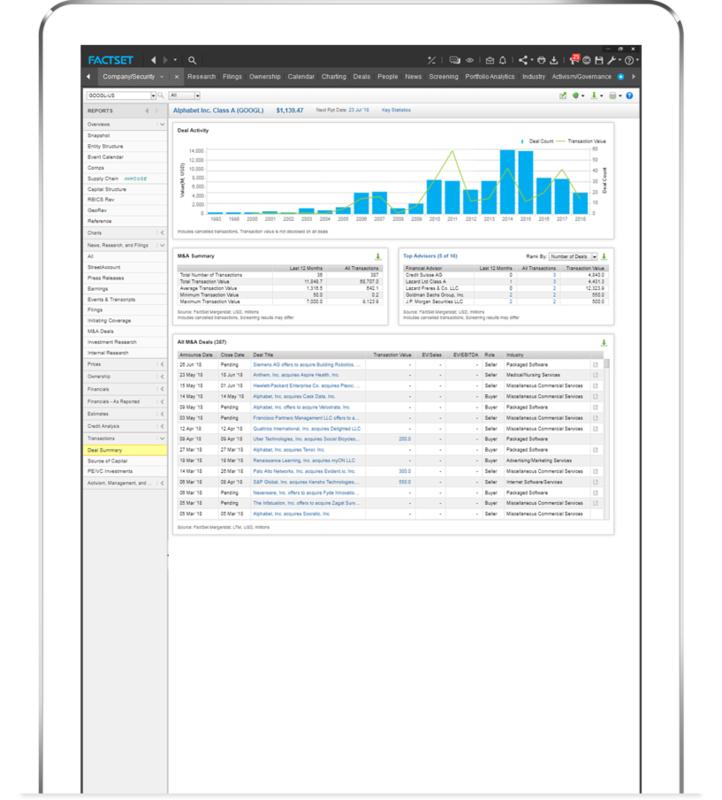 View comprehensive transaction data such as deal terms, dates of announcement and closing, financial multiples, financial and legal advisors, fees, and industry analytics. In addition to deal terms and details, identify participants, attitudes, and company details at the time of the announcement. See the latest details on the public companies looking to raise capital quickly. With FactSet Private Placements, you'll receive details on the deals you're looking for and links to related documents. FactSet covers private placements for public companies that are listed on a U.S. or Canadian exchange and disclose deal terms with the SEC and SEDAR. The company does not necessarily need to be headquartered or operating out of the United States.